This page documents data for Rafinesque (1831), such as genera and species attributed to that publication (including known misspellings, misidentifications, and other unavailable names) as well as taxonomic opinions, if available. Taxonomic opinions refer to uses of genera and species as valid and invalid in that work. Rafinesque, C.S. 1831. 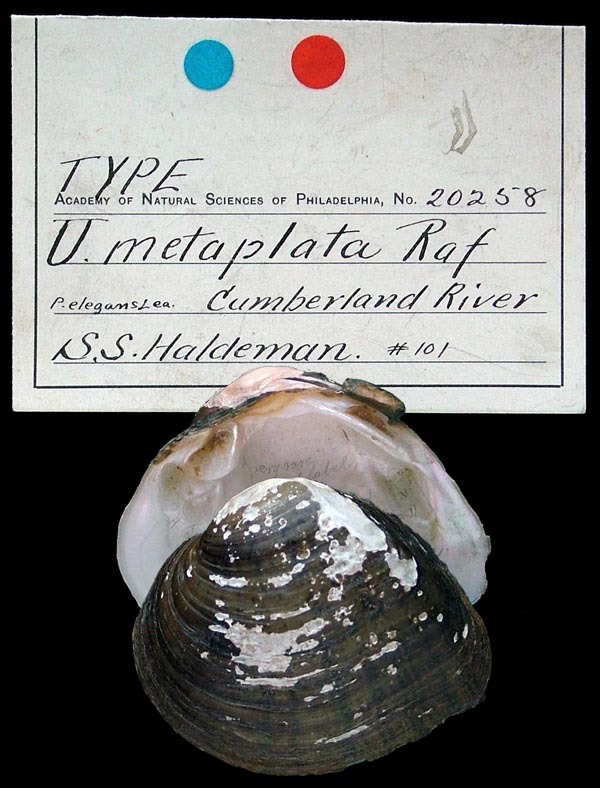 Continuation of a monograph of the bivalve shells of the river Ohio and other rivers of the western states. By Prof. C.S. Rafinesque. (Published at Brussels, September, 1820) Containing 46 species, from No. 76 to no. 121. 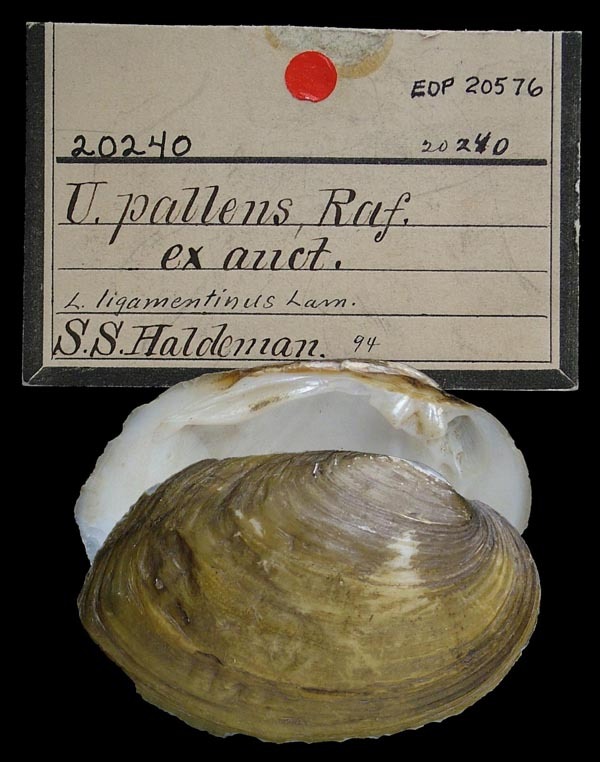 Including an appendix on some bivalve shells of the rivers of Hindostan, with a supplement on the fossil bivalves of the Western states, and the Tulosites, a new genus of fossils. 8 pp. Rafinesque, 1818, Amer. Mon. Mag. 4: 107 [nomen nudum]. Rafinesque, 1819, Jour. Phys. Chim. Hist. Nat. 88: 427. Rafinesque, 1820, Ann. Gén. Sci. Phys. 5 (13): 300. Rafinesque, 1820, Ann. Gén. Sci. Phys. 5 (13): 301. Rafinesque, 1864, [in] Binney & Tryon, reprint: 46, 75. Rafinesque, 1820, Ann. Gén. Sci. Phys. 5 (13): 298. Rafinesque, 1864, [in] Binney & Tryon, reprint: 43, 84. Rafinesque, 1820, Ann. Gén. Sci. Phys. 5 (13): 296. Rafinesque, 1864, [in] Binney & Tryon, reprint: 41, 75. Rafinesque, 1820, Ann. Gén. Sci. Phys. 5 (13): 310. Rafinesque, 1864, [in] Binney & Tryon, reprint: 53, 75. Rafinesque, 1820, Ann. Gén. Sci. Phys. 5 (13): 309. Rafinesque, 1864, [in] Binney & Tryon, reprint: 52, 76. Rafinesque, 1864, [in] Binney & Tryon, reprint: 74. Rafinesque, 1864, [in] Binney & Tryon, reprint: 72. Rafinesque, 1864, [in] Binney & Tryon, reprint: 84. Rafinesque, 1864, [in] Binney & Tryon, reprint: 82. Rafinesque, 1864, [in] Binney & Tryon, reprint: 79. Rafinesque, 1864, [in] Binney & Tryon, reprint: 78. Rafinesque, 1864, [in] Binney & Tryon, reprint: 73. Rafinesque, 1864, [in] Binney & Tryon, reprint: 85. Rafinesque, 1864, [in] Binney & Tryon, reprint: 81. Rafinesque, 1864, [in] Binney & Tryon, reprint: 80. Gray, 1847, Proc. Zool. Soc. London 15: 196. Rafinesque, 1864, [in] Binney & Tryon, reprint: 77. Type(s): LECTOTYPE ANSP_20258, Cumberland River. Rafinesque, 1864, [in] Binney & Tryon, reprint: 76. Type(s): LECTOTYPE ANSP_20240, [no locality available - North America].